(Evening Primrose (Oenothera biennis) - 01) To the best of our knowledge, all of the evening primrose photos in this series are Oenothera biennis; however, since there are about fifty species of evening primrose, the subtle differences of some of these evening primroses in the photos may be of one of these other species. (Evening Primrose (Oenothera biennis) - 01a) The literature says that some of the evening primrose species open in the late afternoon, as their name implies, and then they close the next morning. 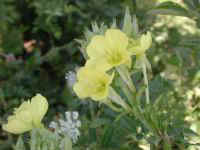 Nevertheless, some of these evening primrose photos were taken during the middle of the day. 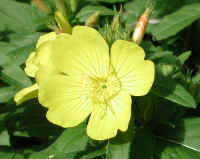 (Evening Primrose (Oenothera biennis) - 01b) Each flower of the evening primrose can vary in size from one to two inches in diameter, with four reflexed sepals, four broad petals, eight stamens, and one pistil with a cross shaped stigma. 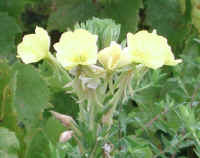 (Evening Primrose (Oenothera biennis) - 01c) The leaves of the evening primrose are lanceolate with wavy-toothed edges. 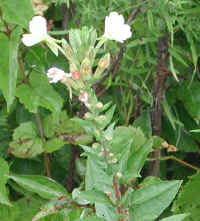 The leaves grow alternately along the stems. Another curious thing is that the only reference to a hairy species that we found was a day-blooming variety of evening primrose, Oenothera fruticosa, but that species had linear leaves unlike the ones pictured here. (Evening Primrose (Oenothera biennis) - 02) In this close-up view of the evening primrose flower, the outer heart-shape of each petal is clearly visible; however it is still difficult to distinguish the cross design of the stigma on the pistil. 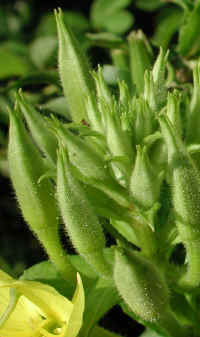 (Evening Primrose (Oenothera biennis) - 02a) In this close-up view of an evening primrose bud cluster, the tips of each of the four sepals can be clearly seen. 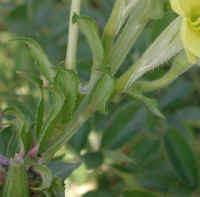 As the bud opens, these sepals will peel back and curl downward as the flower spreads out its petals. 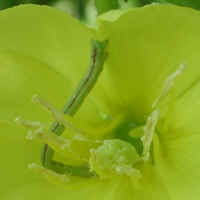 (Evening Primrose (Oenothera biennis) - 03) This evening primrose flower is playing host to an inch worm. (Evening Primrose (Oenothera biennis) - 04) In this photo of the alternately growing leaves of the evening primrose, we can see some of the purple veining, which is usually only associated with the stems, and the wavy-toothed edges. 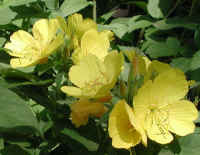 (Evening Primrose (Oenothera biennis) - 05) The evening primrose can grow in height from one to five feet. 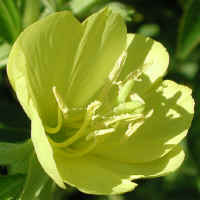 Evening primroses bloom from June through October. The ones in our yard begin blooming in June and stop in July, while others don't begin to bloom until August. We could not distinguish any differences in the plants that might indicate a different species. 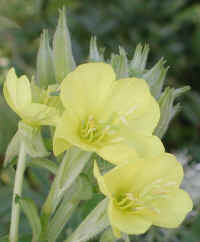 (Evening Primrose (Oenothera biennis) - 06) The bright yellow flower of this evening primrose is just another example of diverse beauty in God's creation. 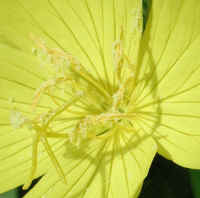 Yellow is the most common color of the evening primrose, some ranging in color from white to pink. (Evening Primrose (Oenothera biennis) - 06a) In this bee's eye view of the center of the evening primrose flower we can clearly see the cross-shaped stigma at the tip of the pistil, and the veining in the petals. 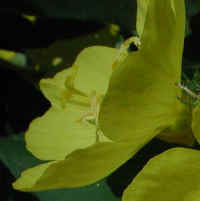 With the light and shadows, it is still difficult to distinguish each of the eight stamens. (Evening Primrose (Oenothera biennis) - 07) Our taking these photos and presenting the beauty of God's creation is a way of "taking time to smell the roses," or in this case, the evening primroses. Taking this time is a way of focusing upon something we hope helps make this a kinder and gentler world. (Evening Primrose (Oenothera biennis) - 08) This is another bee's eye view of the center of an evening primrose flower with its eight stamens and one pistil with the cross-shaped stigma. 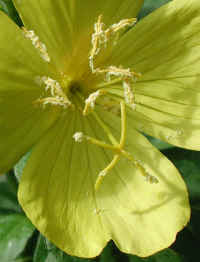 These are characteristic of all evening primroses. (Evening Primrose (Oenothera biennis) - 09) The yellow beauty of the evening primrose brightens up the roadsides, fields, and wildflower gardens. 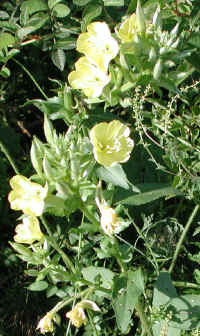 (Evening Primrose (Oenothera biennis) - 09a) According to the literature, the young stems and leaves of the evening primrose have been eaten as cooked greens. 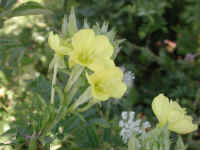 When the roots of the evening primrose are boiled, they taste like parsnip. 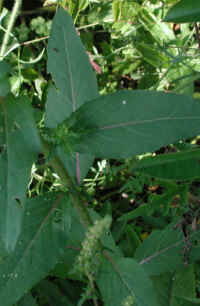 The seed pods were eaten by Native Americans. (Evening Primrose (Oenothera biennis) - 10) Another flowering evening primrose. (Evening Primrose (Oenothera biennis) - 10a) In this side view of the evening primrose, we can see the cross-shaped stigma atop the pistil sticking up above the stamens. 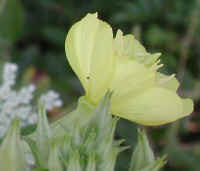 (Evening Primrose (Oenothera biennis) - 11) The newer flowers of the evening primrose grow at the top of the wildflower; and below, we can see the remains of the older flowers. (Evening Primrose (Oenothera biennis) - 12) The bright sun shinning on this evening primrose makes the flowers look almost white.